The untold story of living legend Mavis Staples—lead singer of The Staple Singers and a major figure in the music that shaped the Civil Rights era—researched and written by acclaimed music journalist and author Greg Kot. This is the untold story of living legend Mavis Staples—lead singer of the Staple Singers and a major figure in the music that shaped the civil rights era. Now in her seventies, Mavis has been a fixture in the music world for decades. One of the most enduring artists of popular music, she and her family fused gospel, soul, folk, and rock to transcend racism and oppression through song. Honing her prodigious talent on the Southern gospel circuit of the 1950s, Mavis and the Staple Singers went on to sell more than 30 million records, with message-oriented soul music that became a sound track to the civil rights movement—inspiring Martin Luther King Jr. himself. Critically acclaimed biographer and Chicago Tribune music critic Greg Kot cuts to the heart of Mavis Staples’s music, revealing the intimate stories of her sixty-year career. From her love affair with Bob Dylan, to her creative collaborations with Prince, to her recent revival alongside Wilco’s Jeff Tweedy, this definitive account shows Mavis as you’ve never seen her before. I’ll Take You There was written with the complete cooperation of Mavis and her family. Readers will also hear from Prince, Bonnie Raitt, David Byrne, Marty Stuart, Ry Cooder, Steve Cropper, and many other individuals whose lives have been influenced by Mavis’s talent. Filled with never-before-told stories, this fascinating biography illuminates a legendary singer and group during a historic period of change in America. "[A] fascinating testimony. . . . Kot’s portrayal of Mavis is deft and balanced, worthy of a performance that, no matter howoften you play it, never fails to live up to the promise of its title." "Kot depicts the endurance of Mavis Staples and her family’s music as an inspiration, a saga that takes us, like the song that inspired this book’s name, to a place where ain’t nobody crying." “Kot’s take on the singer’s immense discography is invaluable, and Staples’ indomitable spirit shines through." “Involving from beginning to end. . . . [Kot] charts the [Staples] family’s origins in gospel music; their gradual drift into folk, soul and pop; the reverberations of their increasingly political songs during the civil rights era. . . 'I'll Take You There'...is rich musical history." 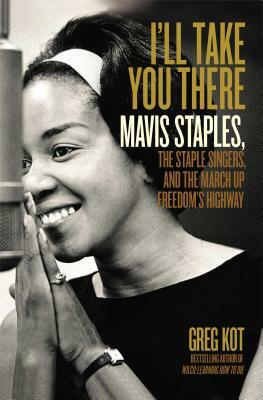 "Remarkable. . . . With Mavis opening up the Staples archives and providing access to family and friends, Kot...[shapes] a story bigger than just that of a singing group. " "A darn good story. . . . Whisking readers over a span of nearly 100 years, author Kot presents aroller-coaster ride of the highs and lows of one of gospel and soul’s mosticonic families. . . . a great look at history, both musically and culturally. . . . If you’re a fan of soul, R&B or gospel, “I’ll Take You There” is a bookyou’ll want to corner." "That Staples' life story is deeply intertwined with the Rev. Martin Luther KingJr., Sam Cooke, the Band, Bob Dylan, Lou Rawls, Jeff Tweedy, Prince, ArethaFranklin, Mahalia Jackson, Jesse Jackson, Curtis Mayfield, Stax Records andJerry Butler is no mean feat. . .The gems are here in all their richness." "Fascinating... Musical analysis doesn't get much better." "Kot has a knack for distilling the stuff of interviews and research into pithy descriptions of the Staple Singers’ lean years."